Wood stove's cranking, dog, cat, family and assorted reptilian pets all snuggled up against the cold weather that seems to have blanketed the Northeast (thankfully, minus the snow). Tonight is a great night to warm up the kitchen with a savory and interesting meal from Kazakhstan, Alma-Ata Plov, Lamb Pilaf, with Russian influences. Pictured is Joe, a leopard gecko, the newest member of our family who arrived this week via neighborhood friends (thank you, Porters!) We never turn any creature in need away from our house. Notice his smile - he digs my cooking. Located in Central Asia and Eastern Europe, Kazakhstan is a transcontinental country that neighbors Russia, China, Kyrgyzstan, Uzbekistan, Turkmenistan and the Caspian Sea. Kazakhstan is also the world's largest exporter of potassium, a mineral that has all kinds of medicinal and nutritive properties. One of the most interesting culinary traditions in Kazakhstan is the Dastarkhan, the traditional place where food is served and eaten. Meals as simple as tea and bread to grand and traditional feasts are served on a cloth, or cloth covered low table. Customs such as a designated tea pourer or that one may never step on or over a corner of the dastarkhan are century old traditions that carry on today. 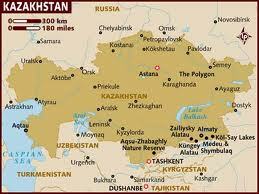 Most meals in Kazakhstan consist of milk (mare, camel or cow) and horse meat, mutton, flat bread or fried dough balls. 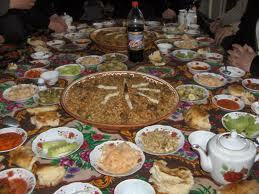 Food customs are infused by Uzbek, Uigur, Russian, Tatar and Korean traditions as well. Preheat oven to 375F. Scatter the almonds on a baking sheet and toast in the oven until golden - about 7 minutes. Set aside and turn the oven down to 350F. Heat the oil in a very large frying pan over a medium high flame. When just smoking, add the cubed lamb and saute for 6 minutes or until well browned. Take the meat out of the frying pan and set aside. Turn the heat down slightly and saute the carrots in the oil for 3 minutes, stirring. Add the onions an continue to saute for another 6 minutes until soft and lightly colored. Stir in the dried apricots, raisins and rice. Cook for 2 minutes until the rice is coated with the oil and becomes opaque. Add the meat to the rice mixture, season to taste, then pour over the chicken stock, orange juice and rind and water. Bring to a boil, then transfer to a large casserole dish an place in the oven. Bake 40 minutes or until all the liquid is absorbed. Remove the Plov from the oven, stir in the chopped apple, top with almonds and dill and transfer to a large serving dish, making a neat mound. Final Assessment: Oops, I forgot to add the apple, but the toasted almonds and dill absolutely make the dish and compliment the lamb and fruit. A great and delicious meal. What a challenge! Great job! I Love Plov. There are so many variations of plov: from simple to complicated. There is also a vegetarian version, you can make just with wallnuts and dried fruit (apricots and raisins). It's very popular to make Ploff in Kazakhstan when you have big events with many guests involved. Normally men cook this dish in a huge cast or thick alloy pot in Uzbekistan. Thank you! When people from the countries I'm cooking in comment, I consider it the highest compliment possible. My goal is learn about each country, as well as show respect and appreciation for the culture and traditions. Thank you as well, for the link!